Unser kopernikanisches Weltbild ist erst 200 Jahre alt. Sämtliche Heiligen Schriften gehen von einem Innenweltmodell aus, bei dem sowohl Sonne als auch Mond gleichberechtigt relativ zur Erde sind und Bahnen innerhalb dieser Hohlkugel durchlaufen. Wie durch Pyramidenforschung gezeigt verfügten die antiken Hochkulturen über extrem genaue Meß- und Berechnungsverfahren. Deshalb darf man das alte Wissen keinesfalls verwerfen. Artikel: Leben wir in der Erde? Die vergrößerte Mondscheibe am Horizont. Every known form of energy decays, even light, namely with the square of the distance, and yet light rays of stars are still reaching us from billions of light years away. Everything is subject to lines of force, (which are curved as is well known), but only light supposedly travels in a perfectly straight line. According to French experiments (Prof. Allais), after 8 m distance it is no longer useful and geodesists (surveyors of the earth) have to use correction factors. Night is never truly dark. Even though light is supposed to travel straight, a glowing mountain can be seen even after the sun has long since set. The poles of the earth at the great distance of 150 million km from the sun do not receive equal amounts of heat, though the difference of that distance is only 6000 km. We have winter even though the sun is supposed to be 5 million km closer on December 12. In all the seasons we do not have the same temperatures, if the sun is a glowing ball of heat. All planets move from East to West, only the earth turns from West to East which is in the opposite direction to all other paths of the planets. In a centrifuge all heavy materials collect on the outside (away from the center) only the lighter ones are near the center, yet only the rotating earth reverses the whole process. The earth never cools off completely, although it is travelling in icecold (-273° C) space with a supposed velocity of 800 km/s around the sun. That with this enormous speed in space, high and lows can form in the atmosphere, and everywhere a layer of air with the same altitude can remain. And all this is in addition to the earth's own revolution of 30 km/s. On a rotating sphere, the heavy land masses are found in the upper half and the lighter water mass on the lower half, instead of a collection of the landmasses near the equator. In the vacuum of space earth does not lose its air. A vacuum conducts neither rays, nor light, nor heat nor gravity, but this is not valid for the sun and its planets. Earth performs a revolution against its path around the sun. Fixed stars do not show a parallax (moving from their postion) while the earth races around the sun 1.2 billion km per year. At a solar eclipse, when the sun is 150 million km distant, the shape of the eclipse is different at various places on the earth. Fixed stars never move although they are found in a moving, expanding universe. We never see the back of the sun, although we are moving around it, while the low and high tides happen at exactly the opposite sides of the earth. Icelanders at certain times can see Greenland. One can see the Alps from the Arber and one can see Africa from Sicily. Two plumb lines hanging in a deep mine diverge at the bottom instead of converge. 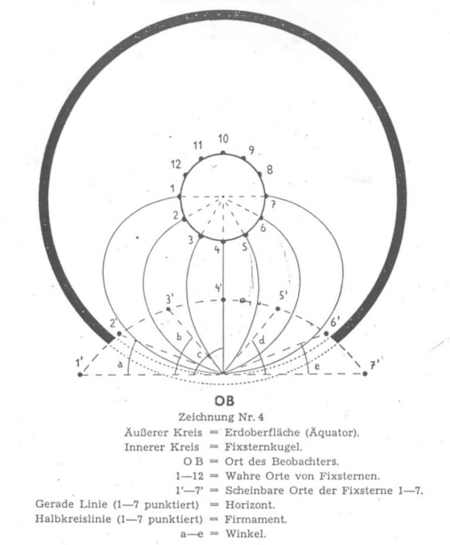 The velocity of the earth was already measured in 1906 by two American university professors and in 1930 by the Zeiss-Works in JENA, and that each time the value zero was found. Already in 1898 the direction of surface curvature of the earth was scientifically determined and measured without official science making any use of this (rectilineator). Television amateurs in England and Holland received programs from Moscow, Peking, and Australia and those in Austria received programs form the USA and South America. In radio transmission, a second directional theory can be used which brings even better results. Dust clouds caused by the landing of a satellite or space probe on the moon was 100 times larger than expected. You can not see any stars from the moon. The altitudes of mountains on the moon were not correct at all but showed values 100 times smaller. It is not possible to obtain scientific measurement data about the shape and size of the moon. On satellite flights, the horizon is always at eye level, according to a statement made by a former astronaut to his colleague in trouble. At the time when Stoltenberg was Minister of Research (Germany) and was visited by the astronaut Borman in Bonn, he said they had seen photos of the earth from which one could assume that the earth was a ball. Based on satellite flights, one calculated a pear shaped earth while press photos showed a solid ball taken on a flight to the moon. A news agency reworked the space photos to show a solid earth. At an altitude of 200 km, one could photograph the solid earth, when the diameter of the earth was more than 12 000 km. With infrared photography one could see the shore of a 24 km long lake although one should only be able to see the roof of a boathouse. The magnetic field of the earth is supposed to be caused by an iron core at the center of the earth, although it is known that iron becomes unmagnetic at the Curie point at 750° C .
Copernicus was a Lord of a Cathedral and not an astronomer, and he definitely stated that his world view was a theory. In mathematics for calculations of unknown magnitudes, one designs mathematical models which can often lead to rather useful solutions but do not always agree with the actual reality.